There is a theory that Robert Louis Stevenson's visit to Unst, where his uncle David built the lighthouse of Muckle Flugga, inspired the map of the mythical island which he drew in intricate detail on his return to the mainland. I too long to feel the joy of exploration and leave my shipmates behind, though I am not sure about the prospect of dumb brutes and fowls. But there is no need to invent my treasure island. 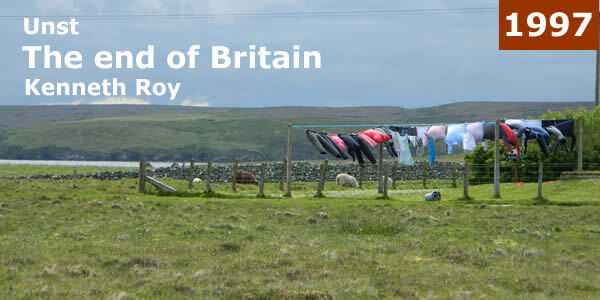 I will make do with Unst – a place so remote that it is almost off the Reader's Digest map of the British Isles. First, though, I have to get there. If you think the age of the epic journey is over, come with me to the end of Britain. 6.00pm Ferry sails from Aberdeen with cargo of 75 souls. Amiable woman taking money for dinner calls me dearie, as in 'We had four hunner in last night, dearie.' Tannoy announcement of weather forecast – wind north to north-westerly – greeted in bar by knowing cries of 'Ah!' from the experts. Good 'Ah!' or bad 'Ah'? Too apprehensive to investigate. 9.30pm Stroll along deck watching lights of mainland twinkle and fade to spine-tingling blackness. 8.00am Ferry docks, Lerwick. Where's stop for bus to Unst? Ask policeman. 'You'll have to walk to the town centre for that.' Minutes later, bus pulls into ferry terminal. Moral of story: don't ask policeman. 8.30am 'You'll be going all the way to Unst?' 'No, you've a lot to do before Unst,' retorts Leasks of Lerwick driver with smallest hint of sarcastic chortle. Set off for Toft, as far as you may go on Shetland Mainland without falling into the drink. 9.00am Bus boards Viking longship for crossing to Ulsta on island of Yell. Correction: not a Viking longship; a dirty wee ferry instead. bags. Who said art of letter writing dead? 10.15am Arrive Gultcher. Awaiting next ferry, breakfast in Seaview Cafe, open all year round with potential customer base in winter of at least 12 passengers a month. 10.30am Third ferry of morning shifting water on deck. Crewman: 'It's OK. Just step over the puddle.' Faint echoes of Titanic, minus orchestra. Step over puddle, end up in wheelhouse. Sky darkens. Last of Britain looms bleakly into view. 11.15am Disgorged outside Indian reservation known as Baltasound chalets. Total journey time (from leaving deepest Ayrshire): 23 hours 15 minutes. hotels on Unst. I can find only one, so I ask someone what became of the other. 'It blew away in the last gale,' he explains in a rather matter-of-fact fashion. The island boasts the British wind speed record of 177 mph, at which point the meter smashed and was just seen heading in bits for the North Sea. But it took more than 177 mph to blow the hotel away. More like 200, they reckon. My chalet is warm and cosy, with Scandinavian pine walls, a big bed, a TV set, and a view of the sea. And up there is the life support system of the hotel, the one that didn’t blow away. Only someone of limited imagination – myself – could fail to speculate about the wind-resistant properties of a chalet. I go at once in search of a taxi. Shortly, a familiar figure turns up. last post office in Britain. Everything in Unst is the last of its kind. I am 821 miles from Hyde Park Corner, 138 miles north of the Scottish mainland, 162 miles from the coast of Norway. Someone in the back of a taxi in Leningrad or Labrador is further south than I am. And this is the last taxi driver in Britain who also happens to be the last bus driver, the last dour one at that. I'd expected a village. Instead I'm confronted by a tiny red wooden post office and, on the other side of the road, by Britain's last public phone box. Two young women in the post office are laboriously writing out postcards. 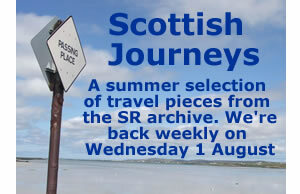 One pipes up: 'Is it true that letters get a special frank from the most northerly post office in Britain?' The last postmistress merely nods. Baltasound once vied with Lerwick as the main herring port of Shetland. At the height of the season, 10,000 worked here at the fishing. Ten thousand! It's scarcely conceivable. I'm out for a walk and there isn't a human being in sight. There are thousands of sheep, though, and not a few short-arsed, lugubrious Shetland ponies. One in a field near the chalet gives me a dirty look every time I pass. But not any more. I was disappointed by the store in question – somehow island shops invite the term store – which now stocks such mundane provisions as cold remedies and cloakroom tickets, as well as socks made in Gwent, and T-shirts overprinted with the words, 'Unst – on the edge of another world.' The assistant is not best pleased, however, when I enquire if they stock Shetland knitwear. They don't. The notice-board in the lobby would tell a visitor from outer space – myself, for example – quite a lot about the local culture. And then my eye lights on a hand-written notice headed 'Common Grazing' over the signature of Gilbert E Matheson, Clerk. What a cycle of life is contained within these few bare lines. The dates probably haven't changed much in a thousand years. I will call him Harold. When he goes outside to 'brave the elements,' he wears a peaked cap that gives him an incongruously rakish air. Harold occupies the chalet next door. He has been here for three and a half weeks. Tonight we dine a few tables apart in the lounge bar of the Baltasound Hotel. He invites me to join him for a drink afterwards. When he is not on Unst, Harold lives somewhere in the home counties. For weeks on end – for months in spring – he is sent here by his company to service the radar equipment at RAF Saxa Vord, the listening station at the northern tip of the island. It's the official end of Britain in more ways than one: the determined patriot may travel to the extremity of his country and find access to its last scrap of land barred by the Ministry of Defence. Saxa Vord remains the main source of employment on Unst, though you will not find it mentioned in any of the tourist bumph. Like the oil (the visible influence of which peters out on Yell), the military presence on Shetland has somehow escaped the notice of the puff-writers, who enthuse about spectacular cliffs, rocky coastlines and pure, fresh air while overlooking the beer cans abandoned on road-sides. In the late afternoon, walking towards Haroldswick, I'd been startled by a car full of aggressive young men travelling at a reckless speed. They had sounded high on something or other. I doubted if it was pure, fresh air. 'Don't you ever bring your wife?' I ask Harold. 'Lerwick doesn't appeal to me,' he sighs, 'but I occasionally go there to look at tool shops.' There is no answer to that. 'Still, you must find your work here interesting,' I persist. Here's Mavis with the drink. Mavis, who sports a colourful poncho, sounds to my untutored ear like a native-born Shetlander. She also has the honour of being the last waiting staff in Britain. I ask her if there's anywhere else on the island we might have had dinner tonight. 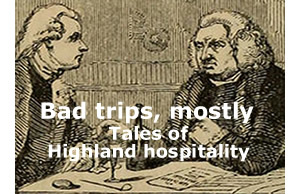 Back in the chalet, I listen to the most familiar sound in all of Unst's long history, a sound that has driven invaders to despair and strong men to drink, shaped its very contours and given its few habitations a stubborn, almost defiant appearance. It is the sound of the wind. Someone said that Scotland would be free only when the last minister had been strangled with the last copy of the Sunday Post. Well, here is the last minister and his name is the Reverend McNab, a serious young man with a shy smile. He comes shuffling into the kirk at Baltasound carrying a shopping bag. Worshippers here were once overcome by a kind of paroxysm. Contemporary accounts suggest that there was scarcely a Sabbath on which this did not occur, the minister persistently having to instruct his parishioners to take a cold bath. Mr McNab appears to have no pastoral problems of such gravity. Forty or so sober souls are gathered for morning service on pews so shallow that broad bottoms must beware of slipping off during the long and closely argued sermon, which takes as its text Psalm 146 – the one beseeching the faithful not to put their trust in politicians. Mr McNab exhorts us always to remember that politicians are reduced in the end to dust, their grand plans having been shattered. It is a comforting thought. Oh, there's Mavis in the next row. 'Would you like to join us for coffee?' asks a kindly woman at the end of the service. I should, but I don't. Instead I go for a long walk along the beach, picking up smooth stones of many colours and wondering if any might be the type known as serpentine. It was on a barren serpentine hill north of Balta Sound that a local youth, Thomas Edmondston, discovered a rare plant, the Alpine Mouse-ear Chickweed, in 1845. He died that same year, aged 20, in an accident on a scientific expedition to South America. Of the plant, his sister wrote beautifully. It has delicate white flowers, finely veined with faint sea-green. Its delicious perfume is as elusive and bewitching as its tints. It blooms on the most sterile ground exposed to bitter winds and salt spray. It lies low on the gravelly earth, opening its coronal with a trust and courage that appeals to the human soul. When you take it in your hand it looks fragile enough to be blown to bits by a breath. As I turn back – to disgruntled Harold counting the days and those restless youths who would rather be anywhere but here – a wide scene confronts me. It is what the tourist brochures call a vista. The land and the sea appear indivisible in the gloom. But gloom fails to convey the quality of this light. It is thunderous, shot through with astonishing streaks of whirling brightness over the sturdy little houses along the far shore. You half-expect the hand of a vengeful God to scoop Unst away, listening station and all. In this elemental place, it takes the trust and courage of an Alpine Mouse-Ear Chickweed to put your head above the parapet. And so I have come to the end of Britain, only to discover that it is not Britain at all in more than a formal sense; and that the idea of a Scottish parliament is an irrelevant footnote under Any Other Business. I'm happy. Who wouldn't be? A seal is following me home.